We have several firsts with this month's Guest Designer Table. 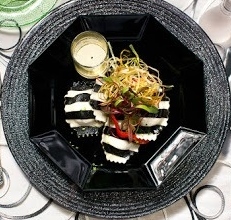 Our first private chef is featured. It is the first time we have seen a high-end and a comparable affordable design side by side in our Guest Designer showroom space. As for the other first, well, you will just have to read to the end to find out! 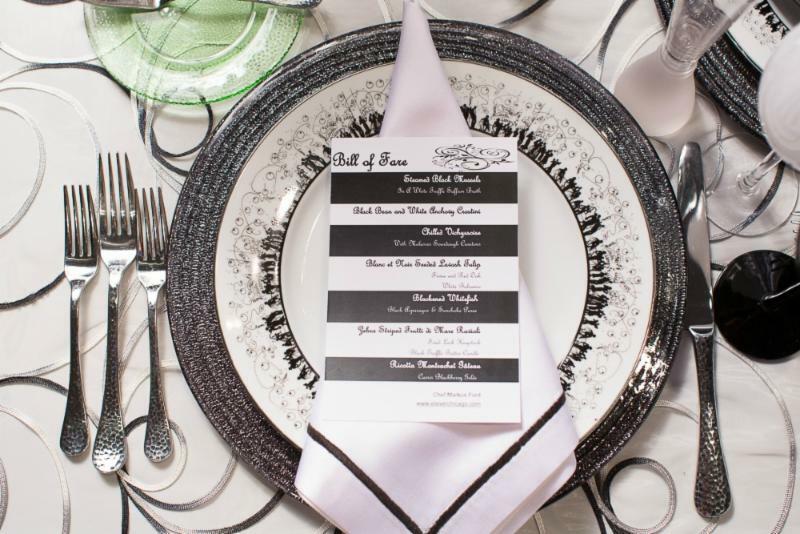 Markus predicts black and white will be a big trend for this fall's social season, so he created a high-end and complementary budget table design reflecting that prediction. 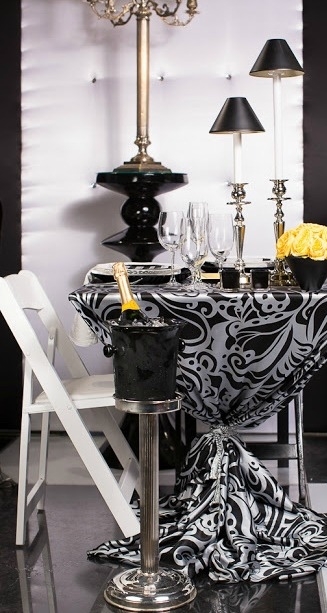 The silver champagne bucket graces his high-end beauty while the black plastic champagne bucket/spittoon sets off his low-priced creation, both of which are tied together with our Black and White dance floor and the glamorous backdrop panels by our neighbor, Advance Event Group. 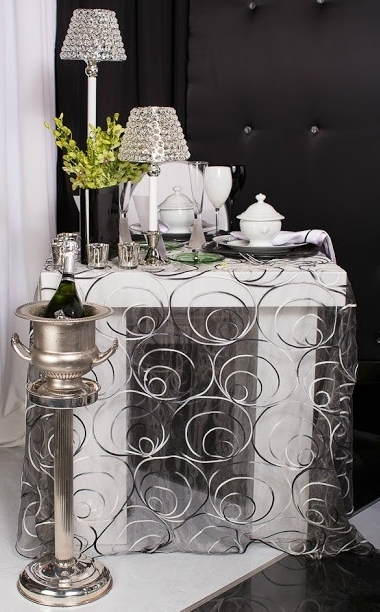 With our Hammered flatware and Black Sparkle charger, there is a lot of texture in the high-end table. The transparent runner overlay, in addition to another layer of texture, gives an ethereal look to our new White Lacquer table. 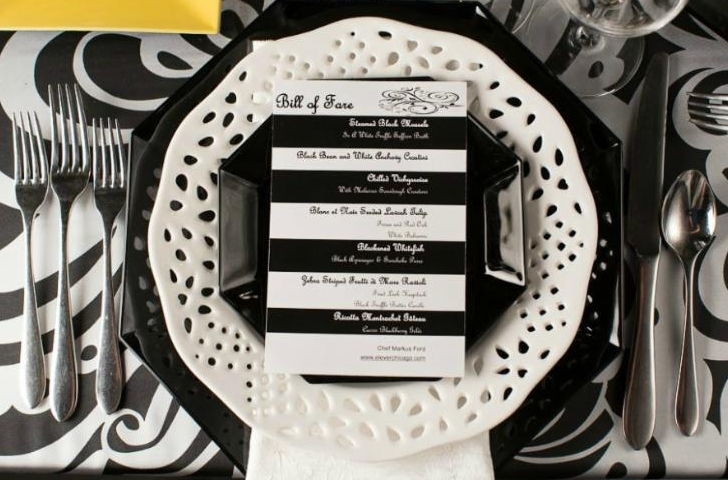 But Markus didn't just plan a black and white design; all the food complements the décor because in Markus' opinion, a party begins and ends with food--contrary to some of us who believe "it is all about the look". 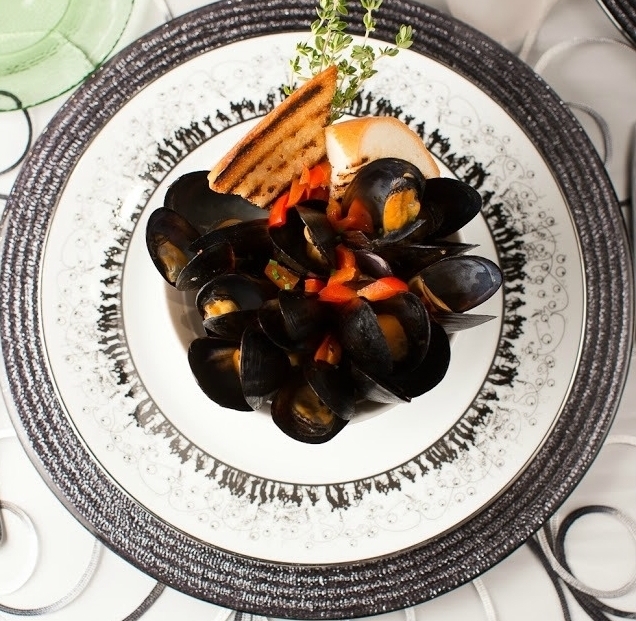 His black and white menu includes Chilled Vichyssoise with Molasses Sourdough Croutons, Zebra Striped Frutti di Mare Ravioli with Fried Leek Haystack and Black Truffle Butter Candle and Steamed Black Mussels in a White Truffle Saffron Broth. Not pictured but equally clever was his Blackened Whitefish. His tip with a menu is "don't try everything brand new at once." Although Markus is always thinking from the food perspective because of his training as a professional chef, he emphasizes that it is important to start with a budget. 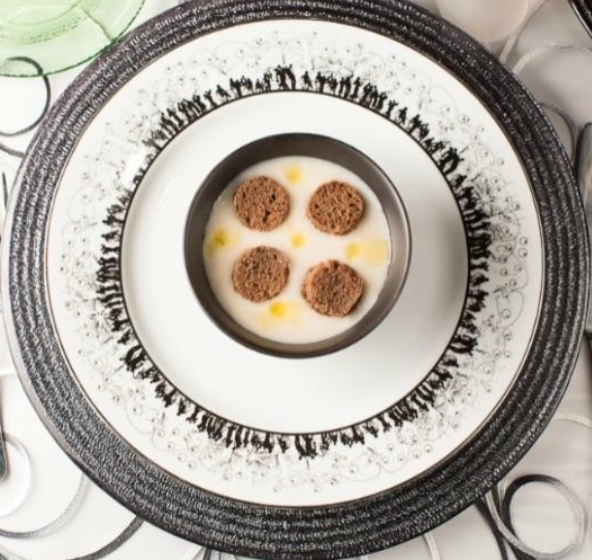 Markus incorporated part of our "Budget Beauty" promotion which includes the Black Octagonal pattern not only because it ties in with his theme, but it allows him to use our more expensive dinner plate, the White Lace Cutout. His pop of color with our yellow, High Gloss b&b plate costs less than a regular white b&b plate. 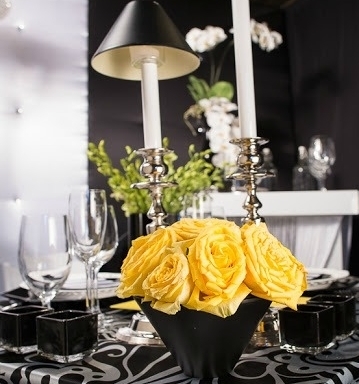 Can you believe the black vase is really just the black candle shade of the candlesticks turned upside down with a stemless martini glass tucked inside to hold the water? Markus is thinking way outside of the box to come up with that. He also thinks creatively in his marketing plan. He highly recommends that caterers have a Pop-up Restaurant promotion. His pop-ups have attracted 50 to 175 people depending on the location and he says over 20% of the patrons have become his clients. His last several events have included a fashion show as well. Fashion has always been an interest of Markus'. 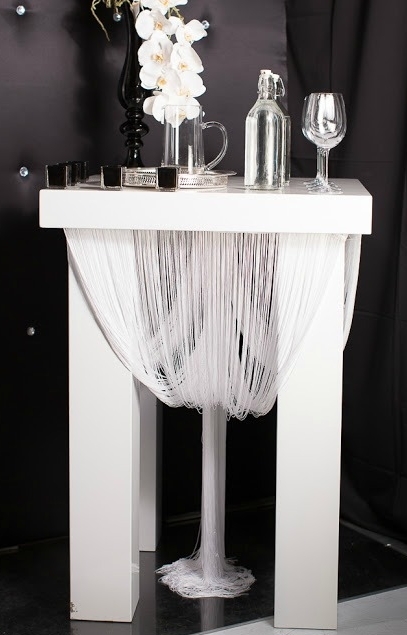 Can you tell that from the way he dressed our White Lacquer highboy with fringe? Markus' career path has included producing fashion events, a stint as a professional model and he has also served on the City of Chicago Fashion Council. And, now that you know something about Markus' interest in the fashion community, are you surprised two models appear in this month's Guest Designer Table vignette? --A definite first here. 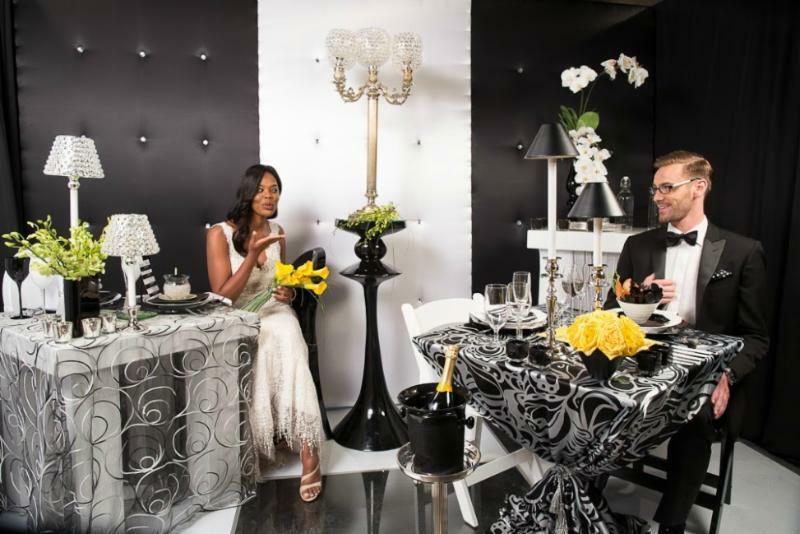 Not only does his table have a name, "Blind Date in Paris", but he uses gorgeous models to tell the story. 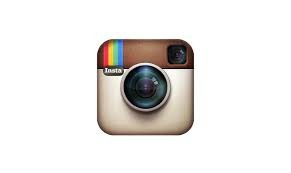 A big shout out to Markus's team who assisted with the design.